This link says the HP Proliant DL 180 G5 server only supports Smart Array E200, E500, P400 and P800 controllers. Can I use a Smart Array P410 instead? Currently the server has only the default internal controller, I need an additional one for better performance and to support additional drives (the default controller only supports 4, with a Smart Array controller all 8 bays can be used). The disks are SATA ones. This will depend on your backplane connections and whether you can find the right parts. 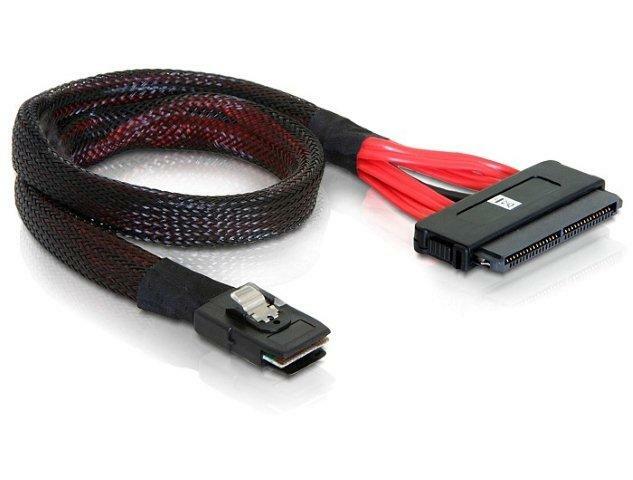 You can use the P410 in an older server, but you'll need to change SAS cables to match the specific backplane connections. G5 systems usually used internal SAS SFF-8484 connectors to mate the Smart Array P400 to their backplane. I've confirmed that your DL180 G5 8-bay backplane has 2 x SAS SFF-8484 ports. The SmartArray P410 has two SAS SFF-8087 ports. You will need a SAS SFF-8087 -> SFF 8484 cable to make this work. For that generation of server and your use-case, though, I'd just use a new-old-stock or used P400 controller. You won't gain anything performance-wise using a P410, especially given the low drive count, the fact that the disks are probably 3G SATA and the age of the system (G5's were end-of-life in 2009-ish). It may not be officially supported but I'm sure it'll work just great, there's little real difference between the 400 and the 410 from the PCI side. Just tried it... but there are 2 problems with this. First, the physical card. While it fits in the low profile slot, does not allow room for a straight through SFF-8087 connector to fit because the CPU heatsink is too close to the end of the card. The P400 has it's connectors at the top of the card, and the P410 has them at the end. You can move the card to the other side of the riser, but you will need to find a full height bracket for it. Second, compatibility. The card I had was bought used so I can't be 100% certain if it is not damaged. I could not get the card plugged in and attached to the backplane and have the server boot. I could get it to boot without a connection to the backplane. I had 2 cables from monoprice, and tried both. I will try again and see if there is anything I missed. I will try the card in a G7, as well, to ascertain if it is damaged. Not the answer you're looking for? Browse other questions tagged hp hp-proliant sata sas hp-smart-array or ask your own question. How can I force HP Smart Array RAID controller to re-recognize drives? HP B110i controller not seeing storage array. Any ideas?